Interior Features Awesome floor plan with high end finishes, hardwood floors and full bed with new laminate wood flooring and remodeled bath on first floor. 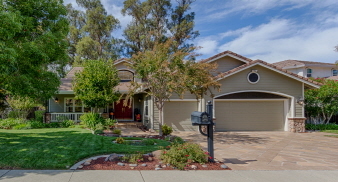 Spacious updated gourmet kitchen opening to large family room with fireplace and surround sound. Formal dining and living rooms, great for entertaining. Huge master suite with retreat, built-in entertainment center, large walk-in closet with custom organizer. Large secondary bedrooms upstairs. All bathrooms have been remodeled within past 6 years. Additional Features and Amenities This custom home offers tons of storage, 3 car garage. Handicap assess available at side yard area. Downstairs laundry room with sink and lots of cabinets. Inside large storage closet. Central vac throughout the home.